Bloomsday, an all-day cafe, is due to open in late April at 414 S. Second St.
A burger bar in University City with unparalleled views of Center City. An all-day cafe across from Head House Square. A Japanese grill on South Street. Two Italian restaurants, a block apart, near Fitler Square. A pizzeria just off West Passyunk Avenue. An outdoor Mediterranean restaurant on Spring Garden Street. A massive outdoor park in Northern Liberties. An all-day bakery/bar from Steve Cook and Mike Solomonov in Rittenhouse. New Chester County locations for two popular restaurants. An upscale pizzeria in an underserved slice of Montgomery County. A French BYOB in South Jersey. That’s just a snapshot, but you get the picture. The next 90 days or so will be filled with plenty of restaurant openings, following one of the busiest periods of dining growth in memory. Here are some of the highlights for spring through early summer. Opening dates, as always, are squishy, given the vagaries of construction, permitting, lunar phases, mojo, and whatnot. Certain high-profile projects — including Jean-Georges and Vernick Fish at the Four Seasons (mid- to late summer); Gabi, chef Peter Woolsey’s French cafe on Broad Street north of Vine (“summer”); Cicala, the swish Italian from chefs Joe Cicala and Angela Ranalli-Cicala at the Divine Lorraine (July); Forsythia, chef Christopher Kearse’s French bistro in Old City (August); the eateries of the Fashion District (late summer); and a Zahav spinoff in Kensington (late 2019) — are farther off. And if you’re playing at home, it appears that the deal to bring the luxe Spanish restaurant Tatel to the former Boyd Theater is off; the space is being marketed. A view of the open kitchen at Bincho, 228 South St., before its opening. Meats grilled over binchotan charcoal is the specialty of a bright, contemporary Japanese restaurant due to open by mid-May at South and American Streets, where Knave of Hearts was years ago. Bincho’s partners are Brian Calhoun, who for two decades has operated the Haagen-Dazs shop on the same block, and Sat Ly, whose family owns Levittown’s popular Hong Kong Pearl. Binchotan, a white charcoal that burns hotter than most other woods, results in a distinctive flavor that does not require a lot of sauces. Bistro La Bête, 1703 S. Ninth St.
Michael O’Halloran (ex-Bistro 7) is doing old-school French in his BYOB on Ninth Street just off Morris Street and not far from the East Passyunk Crossing hubbub. Due to open on or about April 27. Teddy Sourias and crew have revamped Cinder into what they call a “light, fun, casual and yet sophisticated” bar-restaurant with a focus on cocktails and natural wines. Lots of greenery. Opens for the season April 18. The opening of the University City pop-up (36th and Filbert Streets) is TBA. 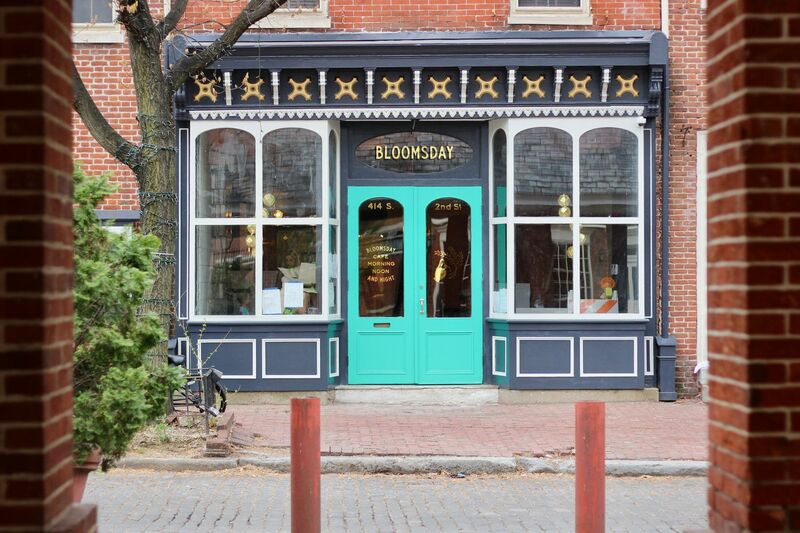 Bloomsday, 414 S. Second St.
All-day cafe/natural wine bar across from the Head House Square shambles from the duo behind Green Engine Coffee Co. in Haverford. First up will be mornings. Kick Axe Throwing, 232 Market St. The Brooklyn-based ax parlor get a soft-opening date of April 22 in Old City. Bring your own plaid. Atmosphere will have the feel of a ritzy mountain lodge, with a large bar, cozy stone fireplace, taxidermy, and board and table games, and there will be a full food menu, including brisket, nachos, thin-crust pizza, and grilled cheese. The bar will be stocked with 20-plus beers, both canned and draft, hard ciders, spiked seltzers, wine, and sake cocktails. The Northeast Philadelphia Brazilian steakhouse comes downtown in the space that was Garces Trading Co.
Coffee and a microbrewery in Dreshertown Plaza, in what most notably was the space that houses Carambola. Its day will start at 6:30 a.m. with coffee and pastries before segueing into beers (eight on tap) with an easy-to-execute pub menu (tots, wings, calzones, sandwiches) offered from midday into the night. Daniel “Pizza Gutt” Gutter, who made a name for himself selling Detroit-style pizzas out of W/N W/N Bar, is taking over a pizzeria in Kensington. Art installations, food and drink vendors, and a vast public space. Chef Bobby Saritsoglou is teeing up Stina, a Mediterranean restaurant that he and his wife, Christina, in South Philadelphia. Pizza will be baked in a wood-fired, high-temp Neapolitan oven, and like the rest of the menu will include North African and Turkish flavors. Sunset Social will offer views of Center City from Cira Green on 30th Street in University City. Sunset Social, Cira Green rooftop park (30th and Chestnut Streets). This is a big one: Branden McRill and developer Brandywine Realty Trust (The Post and Walnut Street Cafe) are adding a seasonal outdoor restaurant on Cira Green’s 11th-floor rooftop park. You can look across the Schuylkill and see much of Center City over a menu of burgers, beer, wine, and cocktails, in addition to special events through fall. Chef Mike Stollenwerk and fiancee Felice Leibowitz, riding high with the tiny Two Fish BYOB, are opening a French-inspired BYOB. Gigi Pizza, 504 Bainbridge St.
Chris D’Ambro and Marina De Oliveira, behind Southwark and Ambra, are setting up a pizzeria in the back of their just-opened Olly at Fifth and Bainbridge Streets. The bar-restaurant chainlet, which just reopened U.S. Hotel Bar & Grill in Manayunk, redo the former Derek’s. Wine Dive, 1506 South St.
Heather Annechiarico and Chris Fetfatzes are going next door to their bar The Cambridge with this wine shop serving a budget-priced menu. Palma’s Cucina, 23rd and Spruce Streets. Fitler Square Italian staple Mama Palma’s is being renovated. Entrees will be emphasized over the pizza. Cotoletta Fitler Square, 23d and Pine Streets. The crew from the well-received Bala Cynwyd Italian cutlet specialist adds a Fitler Square location with a bar; it’s the former Tria. Edwin Social, 1033 Spring Garden St.
Avram Hornik and crew, fresh off the opening of Craft Hall on Delaware Avenue, are behind this outdoor Mediterranean restaurant in the emerging SpringArts district. Chef Adam Diltz’s long-awaited fine-dining American BYOB in Fishtown whose cooking celebrates the region. Stove & Tap, 245 Lancaster Ave. (Lincoln Court), Frazer. Vince’s Pizzeria (two unrelated locations). The institution on Grant Avenue in Northeast Philadelphia has not one but two unrelated offshoots in the works for Bucks County, each to be operated by members of the extended family. Ed Murray, whose parents operate the original, is working with wife, Heather, on a location at the former Ariana’s Little Italy at 573 Durham Rd. (Route 413), near Owowcow Creamery’s shop in Wrightstown. This will have a self-service, 20-tap beer wall stocked with 15 beers, four wines, and a cider. Also on the way: Vince Rota, another grandson of the founders, is behind a location due to open in late spring at 2500 State Rd. in Bensalem, part of an enormous mixed-use complex that will include Broken Goblet Brewing. The owners of Jasper’s Backyard in Conshy head across the river to the former Imbibe space for what they’re billing as a neighborhood-friendly drop-in, open daily, with sandwiches and small plates from chef Hilary Hamilton. Decor is being lightened up, and a tap system is being added to the bar, which also will serve a selection of local spirits. Joncarl Lachman (Noord) creates a bruncherie at the old More Than Just Ice Cream in Washington Square West, including a Northern Europe flair. K’Far, 110 S. 19th St.
June is the target for the all-day Israeli-ish bakery/bar from Steve Cook and Michael Solomonov at the new Harper building near Rittenhouse. It’s a bigger stage for Camille Cogswell, their pastry chef at Zahav, who won the James Beard Award last year for rising star chef. A Zavino-ish spin-off, with pizza, Italian food, wines, and stylish surroundings, comes to Springfield, Montgomery County,, a short hop from Chestnut Hill. Another location for the popular, upmarket Italian wine bar. It takes the former paper mill that housed Firecreek and Milito’s. Triple Bottom Brewery, 915 Spring Garden St.
“People, planet, profit” is the mission of this microbrewery opening across from SpringArts (and Roy-Pitz and a forthcoming Lucky Well BBQ restaurant). The Institute Craft Bar & Kitchen, 525 N. 11th St.
Charlie Collazo relocates his corner bar from 12th and Green to the nearby Independence Press building.